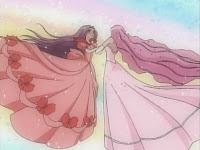 In this episode, there's an Utena spoof. That's really all you need to know. Man, these early episodes are repetitive. One of the biggest flaws of the Digimon Emperor arc is how easy it is to be episodic instead of continuing a linear storyline. Even in the early Adventure episodes, the kids had to physically go from one location to the next, and new Champions were being introduced every time. With the first batch of Armors already here, it's a lot of “enter computer-save day-go home” that doesn't leave a lot to build off of. It's a by-product of the kids being stationed in the real world, but that alone isn't an excuse. 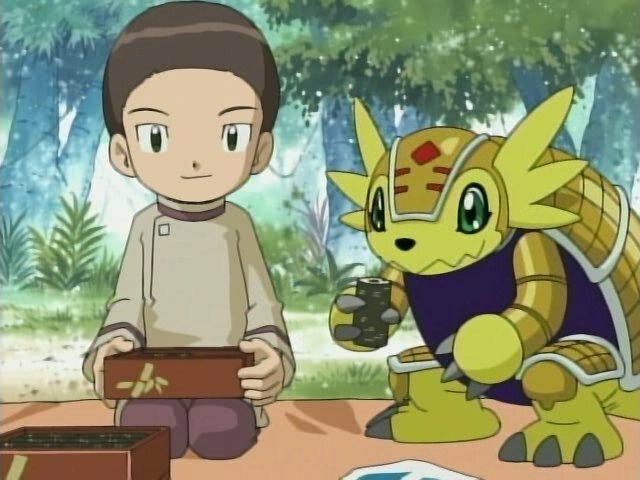 Tamers gets by on the sheer amount of early character development and the early stories in Data Squad are at least marginally interesting. These last three episodes have all focused on stacking one of the new kids up against one of the old kids. The only departure this time is that while Matt was not all that impressed with Davis and Joe merely sees the potential in Cody, Mimi absolutely adores Yolei. Why shouldn't she? While Matt and Joe headed up the operations in their episodes, Yolei is the clear hero here. When a sushi mishap separates her and Mimi from the rest of the group, Yolei's the one to recognize that the Gekomon and Otamamon are enslaved and answering to the Emperor instead of the Princess. Yolei's the one to lead Halsemon in dominant fashion against the Roachmon brothers. Mimi offers some great suggestions, but Yolei does the bulk of the work. Yolei still adores Mimi all the same, wishing they could be sisters in a particularly jarring Utena moment (particularly since they're running from the Roachmon at the time). This stems from the enemy's fraternal antics, either extreme hate or extreme courtesy depending on which version you're watching. Either way, it was another missed opportunity to delve into Yolei's family life. Given that her rivalry with her siblings is apparently so great that it constitutes her primary angst at the end of the series, it really should have been mentioned at some point. While the episode does follow the same pattern as the last two, “(Gabumon/Gomamon/Palmon) needs help from (Matt/Joe/Mimi) to help free the (Gazimon/Gizamon/Gekomon) from the control spire's power,” at least it's framed differently. It's a day off from school and the kids sneak in, smuggling their Digimon in particularly uncomfortable conditions. Kari, TK and Yolei are all quite cruel to their partners here (TK's the worst: he almost forgets Patamon completely!). 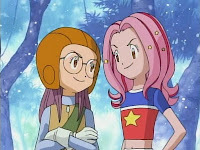 Mimi joins in not because she got a distress signal from Palmon, but because she walked by the school, felt nostalgic and hell, the kids left the gate open. I don't like to harp on the English/Japanese differences, but there's a remarkable duality in this episode in that the dub changes key things and omits certain details, while also preserving very important cultural notes. On one hand, the dub changes the Roachmon brothers from being constantly polite to each other to being constantly bickering (their arguing after being freed is played as a silly twist in Japanese). It also doesn't bother explaining why Mimi's in Japan in the first place. On the other hand, at least the dub recognizes that she is in Japan. Mimi has to reset the clock on her digivice, suffers jet lag, and salivates over the authentic Japanese convenience store food Yolei brings to the picnic. While many dubs (including another popular show ending in “-mon”) somehow turn rice balls into hamburgers and donuts, here they remain rice balls and sushi. The specifics are simplified somewhat, and one type of sushi is changed to a different type of sushi for a silly joke, but give them credit for not changing too much. While on the subject of Japanese cultural references, also give them credit for keeping the Utena bit, considering the entire cast of Utena is actively bisexual... except for Juri. She's a lesbian. Gotta say, those airport PA announcements in the dub are still pretty damn funny. So I watched this one in Japanese, and yes it was mainly to see if that version had any more subtext between Miyako and Mimi. It didn't, but I was particularly amused by some of the music choices. Takeru's season one image song Be All Right, a slow inspirational ballad, is for some reason playing on the convenience store radio. Also, Hikari is happily humming Armor Evolution song Break Up as she heartlessly stuffs Tailmon into her bag. Most epic thing about Mimi's appearance in this episode? She has her own stat screen. STAT SCREEN! That is the first, and probably last, time I'll reference a Digimon abridged series in this blog. Annoyed as Kari often is with Davis's crush on her, she happily plays him like a fiddle to get him to stop for lunch. Her look of smug satisfaction (and TK's look of disgust) is priceless. You know things are getting repetitive when even the Digimon Emperor asks who the monster of the day is. In episode two I had mentioned Ken and Veemon occasionally stumbling into similar voices and how that wasn't a problem with Cody and Mimi. Well, there was one moment when the Roachmon were arguing when Mimi mutters something sounding an awful lot like Cody. It was kinda weird.